You can join the fight against poverty. Volunteers are our secret weapon in this fight. Caring individuals and neighbors perform 1/3 of the work at Crisis Assistance Ministry, a gift that exceeds $1 million in value annually. A few hours of your time makes it possible to prevent homelessness and preserve dignity for more Charlotte-Mecklenburg families each day. Opportunities include individual and group tasks, one-time or recurrent commitments, and a variety of roles across the agency. Individuals perform a variety of tasks to support neighbors during a financial crisis. 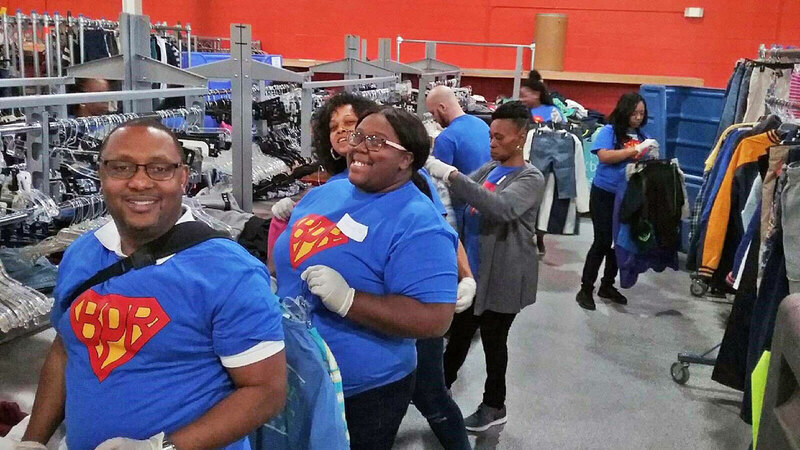 Opportunities include serving customers in the Free Store, helping with clerical projects in our offices, helping at the Furniture Bank, working behind the scenes to inspect and prepare donations in the Free Store Warehouse, and helping families get connected to benefits like food assistance. Groups of volunteers conduct clothing and furniture drives, help inspect and sort donations, assist in loading and unloading furniture, purchase and build dressers, and provide meals or snacks to customers waiting in our lobby. Whether you are a part of a team through your job, faith partner or you are interested in volunteering with friends, there is an opportunity for your group! Family volunteerism is welcome here. Many roles allow children to serve with an accompanying adult.